During his visit to the Galapagos Islands Charles Darwin saw that each island was populated by a little finch. These birds were all very similar, yet from one island to another there were some differences in the size and shape of the beak. Darwin reasonably concluded that in the distant past a pair of these birds had been blown 600 miles from the mainland and had since multiplied and spread. The environment on each island was slightly different and the birds had developed specialized beaks to exploit the different food sources; it seemed to Darwin that here was a unique example of evolution in action where 13 different species had arisen from just one mating pair. A species is defined by the ability to reproduce, thus a sterility barrier separates one species from another. 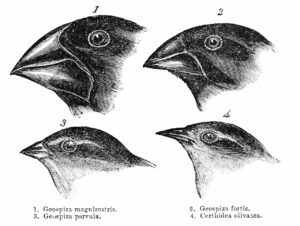 Textbooks use Darwin’s finches to claim that new species have been produced, thus demonstrating evolution in action. However, the facts are that at least six of these different birds are known to interbreed and thus by definition are not new species at all but simply varieties within a single species. Moreover, DNA studies reveal very little difference between any of these birds and there is no evidence of new genetic material, which is essential if evolution actually took place. Prayer: Dear Father, I thank You for Your Word that tells me of salvation. Amen.